"Our goal with Unity is unprecedented ease of use, visual style and performance on the Linux desktop. With feature freeze behind us, we have a refined target render of the Dash for Oneiric. We’ve moved from the idea of “Places” to a richer set of “Scopes and Lenses”. Scopes are data sources, and can tap into any online or offline data set as long as they can generate categorised results for a search, describe a set of filters and support some standard interfaces. Lenses are various ways to present the data that come from Scopes." Mark also shared a screenshot of the Unity Dash from Oneiric. "I’ve heard all sorts of rumours about cool scopes in the pipeline and I bet this will be fertile ground for innovation. It’s pretty straightforward to make a scope, I’m sure others will blog and document the precise mechanisms but for those who want a head start, just use the source, Luke." 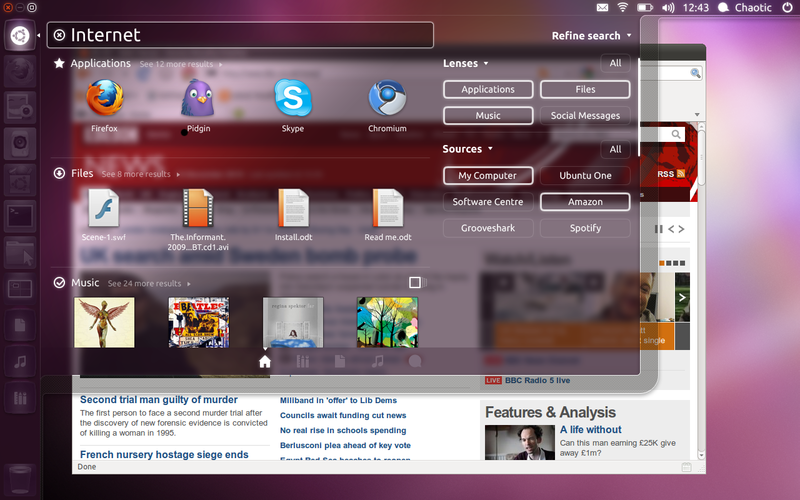 The Dash has been merged in to the Launcher in favor of space for window control buttons whereas it used to be in the top left corner as the BUB. "Rather than a flat darkening, we’re introducing a wash based on the desktop colour. The dash thus adjusts to your preferred palette based on your wallpaper. The same principle will drive some of the login experience – choosing a user will shift the login screen towards that users wallpaper and palette." And moreover, both Unity 2D and 3D now share a good deal of common code and services.